Lord Brahma, the creator God of the Trinity appears seated on a lotus (a symbol of glorious existence), He has four heads and hands. Each hand is holding a sacificial tool (sruva), the Vedas (knowledge), a water pot(kamandalu) and a rosary respectively. His vehicle is a swan (hans) which is known for its judgment between good and bad. 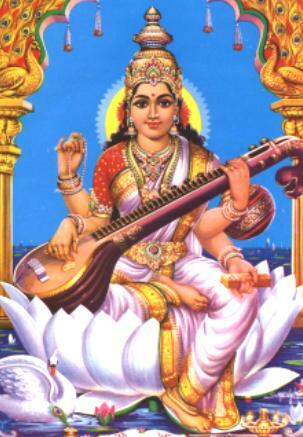 Lord Brahma's consort is Goddess Saraswati, the Goddess of Learning. Vyas describes the Bhagavat Purana as his own greatest work. Therein he describes that Sri Brahma Deva is the personification of Raja Guna, or "Creation" within the material manifestation, and is directly the Supreme Deity in this material realm, in light of the fact that it is His creation, so to speak, though he creates under the directio of Vishnu, who is the personification of Sattva Guna, or maintenence. Sri Shiva on the other hand, is considered to rule over Tamo Guna, or the mode of ignorance. He's not in ignorance, but rules over it. So anyway, each male personality has a female counterpart, which represent the Shakti or energy of the male. In regards to Krishna, Radharani is considered his "Hladini Shakti" or pleasure potency, and being as He is the Supreme Being from whom all other creations flow, all things mimic his ways, as his children. So Saraswati is the personification of the female potency of creation, because like her male counterpart, she is identified with the Rajas Guna mostly by signification and purpose. However, Brahma is Sattvic, as is Saraswati. They themselves are very very Sattvic. They rule over the Raja Guna, or signify it and carry it out as their work. The female side of anything is the beauty, the responsivity, the nurturing. So in creation, as humans, our needs are met by her. Knowledge guides us on the right path and to the fulfillment of our necessities gathering. Music soothes and entertains us, helps us to cope. Scripture is our guide, and fills our inner heart space with what it needs, which is knowledge of our ultimate prospect of returning home to Godhead. So Mother Saraswati is indeed the mother of everyone is creation since her husband is the father of the creation. So she endevours to fill it with the goodness that it needs. She is all good. Her messages are always helpful and pure. Following her will give one true knowledge, light, helpfulness, goodness. She believes that this world can be a good place for all God's children. Her and Her Husband endevoured to follow Vishnu's wishes exactly. They believe this place has a purpose and they have taught that- holding scripture and the instruments of higher learning. Shiva agreed to participate in worldly affairs and so married Sati, daughter of the primal priest-king Daksha. Shiva's unworldly ways annoyed Daksha who refused to invite Shiva . Insulted, Sati rushed into her father's sacrificial hall, leapt into the fire-altar and killed herself. The ceremony, contaminated by Sati's blood, ground to her halt. In his rage, Shiva killed Daksha. Sati's death broke Shiva's heart. He turned into a recluse and retired into a mountain-cave, where he meditated, bridling his mind, restraining his senses, until the restrained energy transformed him into a pillar of fire. In fear, the gods approached the mother-goddess Shakti. "Let his energy be released. Let it be transformed into a warrior who will command the celestial armies," they begged. In response, the goddess took the form of Parvati, princess of the mountains, and sought to win Shiva's heart with the help of Kama, god of love. But when Kama shot his love-dart at Shiva, Shiva opened his third-eye, let loose a fiery missile and reduced him to ashes. Parvati then became a hermitress and mortified her body through austerities that won Shiva's admiration. He accepted her as his consort. They embraced until Shiva shed his seed from which arose Kartikeya, commander of the gods. Inspired by Parvati's beauty, Shiva made music and began to dance. 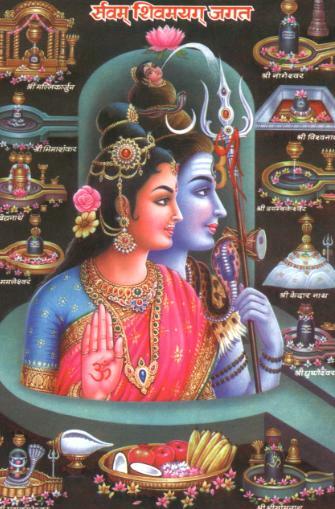 Parvati also cajoled Shiva to reveal the secrets of the cosmos locked in his mind. Many seers were enlightened when they overheard their conversation. Everyone worships Parvati, the goddess who transformed the austere ascetic into an amorous householder. 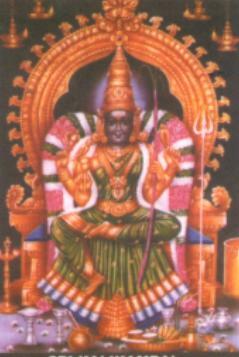 Aryamba was a very devoted and pious woman. She observed many a sacred practices and to her was born the great world teacher, Adi Shankaracharya. Many years ago in this country when the practice of Dharma was on the decline Adi Shankara appeared on the scene and propagated the ancient Vedic Dharma in the form of Advaita or the philosophy of non-duality. It was Panchami, a Sunday in the month of Vaishaki of the year Nandana In the early hours of the morning during the ‘Brahmamuhurtha’, Shankaracharya was born in a place called Kaladi, a village in Kerala. At the early age of five, Adi Shankara learnt the Gayathri Mantra. He learnt all that was contained in the Vedas by the time he attained the age of fourteen. He prepared the texts and his commentary acquired the name ‘Shankara Bhasya’ His fourteen disciples accompanied him when he travelled all over India. Once when he was staying in Benares, he noticed an old Brahmin in a house reciting some rules of Grammar. Shankara entered that house and said that reciting Grammar rules will not help him at the end. Sing the glory of Lord Govinda, utter the name of Lord Govinda; Oh, you ignorant person. You should go on uttering the name of the Lord. It will not be possible for you to do so when death faces you and you are close to it. Reciting the rules of grammar cannot save you. Adi Shankara composed Dwadasa Manjari also (Series of twelve verses). After having composed a total of thirty-one verses, the name Moha Mudgara was given to them and were handed over for posterity as the Bhaja Govinda series. The goddess immediately set out to do battle with this dreaded demon in the form of Kali. Her eyes were red, her complexion was dark, her features gaunt, her hair unbound, her teeth sharp like fangs. As she rode into the battleground on her lion, Raktabija experienced fear for the first time in his demonic heart. Kali ordered the gods to attack Raktabija. She then spread her tongue to cover the battlefield preventing even a single drop of Raktabija's blood from falling on the group. Thus, she prevented Raktabija from reproducing himself. Kerala is known as the Parasuramakshetra-the sacred land of Parasurama. How did it acquire that name? Parasurama is one of the Avatars of Vishnu. When Parasurama’s father (Jamadagni) was beheaded by a Kshatriya King, his mother Renuka, cried in anguish: "Rama! Rama! Parasurama, who was away from the ashram(hermitage) could ethereally hear the cries of his mother from afar and rushed home. He counted that his mother had called him twenty-one times. On reaching the ashram he saw his father’s head severed from his body. The horrible crime had been committed by the king Kartavirya’s sons. Parasurama took a vow to wage a war against the vile kshatriya rulers twenty-one times and end their rule on earth. Parasurama accomplished his mission by defeating the Kshatriya kings twenty-one times and came to his ashram to pray to his ancestors for restoring his father’s life. The sage Bharadwaja, to whose gotra (lineage) Jamadagni belonged, appeared before Parasurama and restored Jamadagni to life by placing the head and body together. After this, Parasurama felt that the purpose of his advent had been achieved as he had no desire to be a ruler, he made a gift of all the territories he had conquered to the sage Kashyapa. He felt that having given away everything, it would not be right for him to live on the land he had gifted. He decided to reclaim some from the sea and settle down on that territory for the rest of his life. It is this area that is known as Parasuramakshetra, also known as Kerala. He performed penance on a mountain called Mahesha, which is situated in Kerala. Narada is the supreme example to the world of one who realised the Divine by continuously singing the glories of God under all circumstances and at all times. Narada, who was born out of the mind of Brahma, demonstrated to the world the supreme spiritual efficiency of singing the Lord’s glories. Narada took the position of a Guru and used Vyasa to explain the function of a Guru and so in this context, it is referred to as Vyasa Poornima. Narada was the son of a servant woman who was working in a house where the Vedas were being continuously recited. In order to celebrate the four months of rainy season the house holder of the house where Narada’s mother was working invited a large number of rishis. She was given the task of attending to the needs of the guests in that house. At that time Narada was only six years old. Sitting with the rishis, he was concentrating with a single pointed devotion on Vedas that were being recited. After the celebration was completed, the rishis were preparing to depart to their ashrams. Narada was desiring to go with them. But looking at his age, the rishis did not take him but taught some mantras which Narada learnt. One day Narada’s mother was bitten by a cobra and she died instantly. He saw the struggle his mother underwent. But he was not moved by it. He was detached. He left for the forest. He felt tired. He heard a voice asking him to leave his personal ‘I’. After listening to this Divine voice, Narada went and sat under a tree. He contemplated on ‘Soham’ which means giving out and taking in of the breath as an aspect of God. Although Narada had no complete knowledge of the Vedas, he regarded the taking in of breath as the aspect of Sama Veda and the giving out of breath as that of Rig Veda.